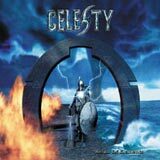 Celesty is a six piece band hailing from Finland, playing epic power metal and this is their debut record. As far as debut albums go, this is one the better ones I've heard in a while. After struggling with lineup changes the past couple years, the band finally put together the stable lineup that appears on this album. Celesty opened for Sonata Arctica a handful of times during the past year and released a second demo. The second demo drew significant attention from labels, and Celesty eventually signed with Arise Records. I am now pleased to have the band's debut in my hands. Reign of Elements is a very consistent album in that the song structures are of a high quality from start to finish. With the exception of the concluding ballad, the songs are driven by furious double bass, never losing their epic feeling or very strong sense of melody. Keyboards are used strategically, delivering an uplifting, epic feeling to the album. The rhythm section provides a solid backdrop for the sound. The drumming is very fast, yet tight and clear. The bass guitar is played authoritatively which provides a rich, well balanced sound. In terms of tempo, catchiness, and atmosphere, the Ecliptica album of Sonata Arctica would be a fair comparison. The marriage of speed, melody, and keyboard enriched atmosphere is not terribly original, but it is very well done. I'm sure Celesty won some fans over during their few gigs with Sonata Arctica this past year. One minor complaint during the title track: the spoken narration (about 20 seconds) during the middle of the song is quite silly! Many bands use spoken narration briefly in certain songs, and for me at least it almost always sounds ridiculous. While the music of this album is excellent, the lead vocals are the weak link in the sound. I do enjoy the sound of his voice, but the vocal delivery is a bit thin and there are some moments where he struggles in the high octaves, but other moments that he nails the high notes beautifully. Actually, his delivery reminds me a bit of a younger Kai Hansen. Kai Hansen has evolved tremendously behind the mic over the years, and I am confident that Kimmo Perämäki will evolve with time as well. Those of you who enjoy epic power / speed metal such as Sonata Arctica and Freedom Call should check these guys out. This debut album shows a ton of promise with its wonderful blend of speed, atmosphere, and melody. I'm already anxious to hear how the band grows and progresses on their follow up album after establishing this impressive starting point.